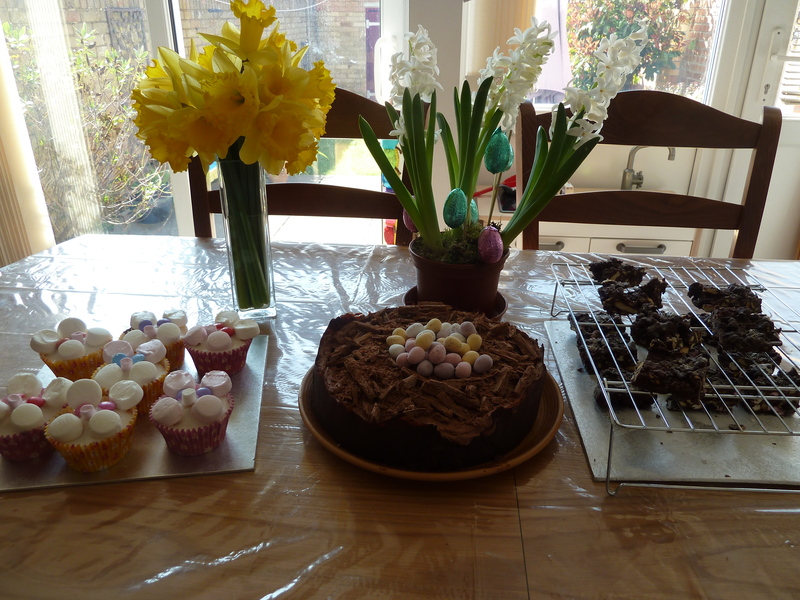 The last of my three Easter bakes, this one was somewhat more complicated than the other two. 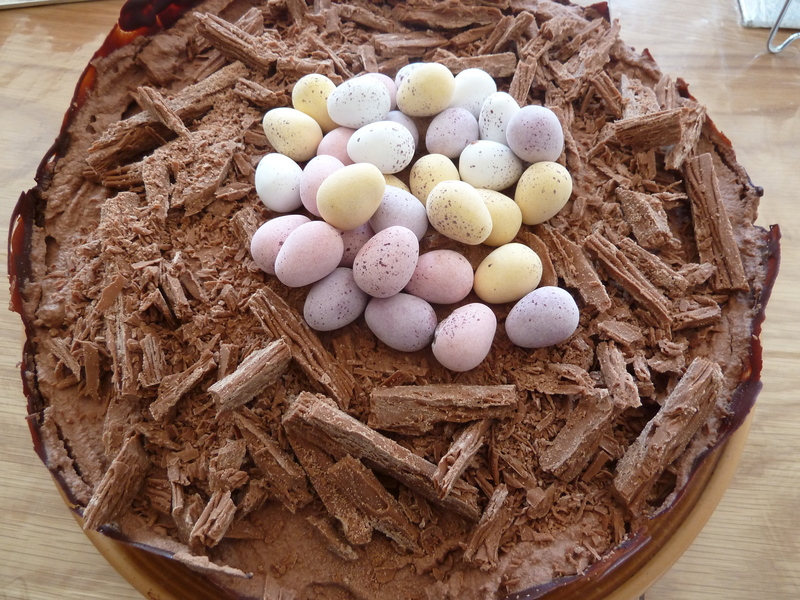 I have made it before, which helped, and I really wanted to give it a go because it has a chocolate mousse layer – something you can’t really eat when pregnant, and there were three no-longer pregnant ladies in the house (me included) for our Easter weekend gathering. There are four stages to making this cake. The first is to make a basic chocolate sponge, so it starts off fairly easily. The second stage is to make a chocolate collar to go round the cake, which you need to do once the sponge has baked (so you can measure its exact circumference). Making the chocolate collar is simply a case of melting some dark chocolate and pouring it onto a strip of greaseproof paper that you’ve measured out to the right size. The tricky bit is getting the chocolate at the right time so you can wrap it around the cake without it breaking. 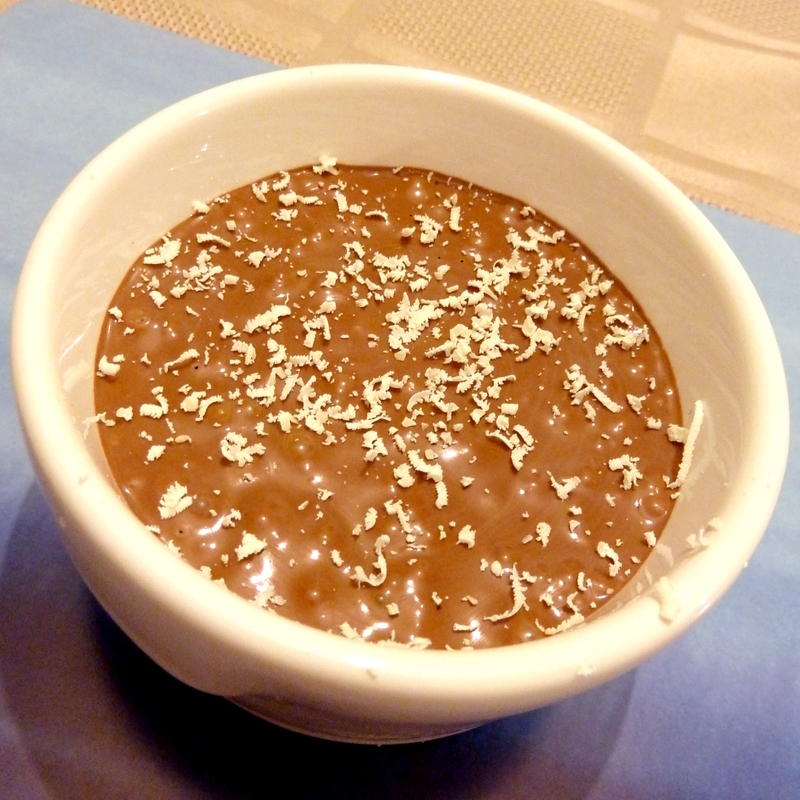 The third stage is to make the chocolate mousse by egg yolks, sugar, cornflour and milk. You then boil more milk, pour it over the egg yolk mixture, and cook them together gently. 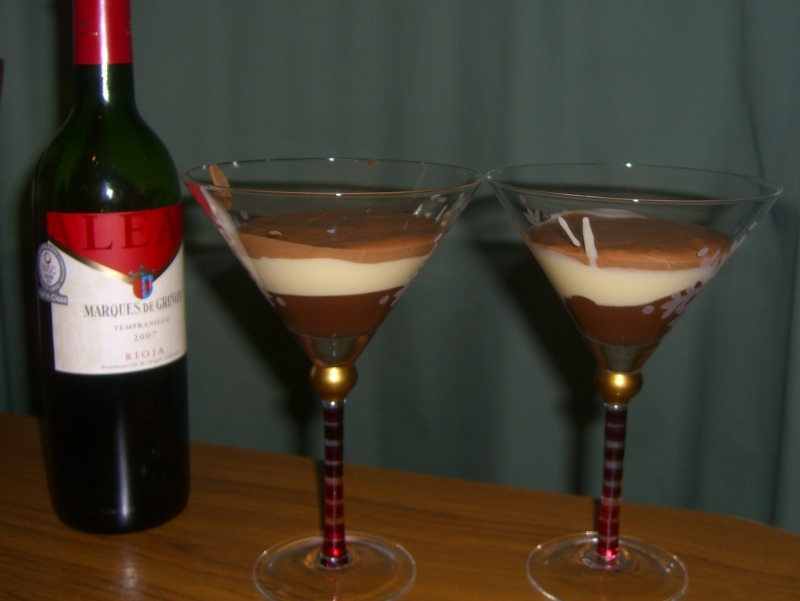 You then add the gelatine and chocolate to the mousse. Once the mousse has started to thicken, you add whipped cream and then pour the mousse mixture onto the top of the chocolate cake. 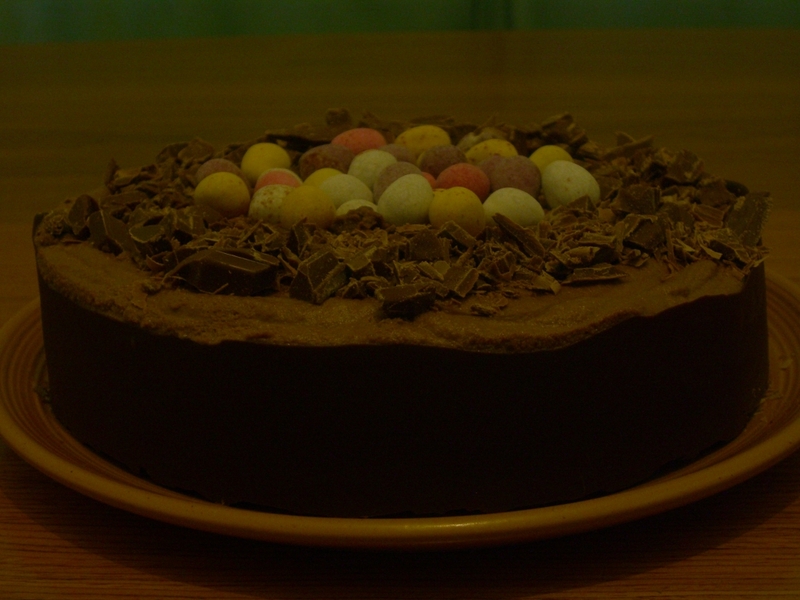 Once the cake has been in the fridge for a couple of hours, the fourth and final stage is to add shards of chocolate (I used Flake) to the top of the mousse layer, and some Mini eggs in the centre to make it look like a nest. Not a recipe I attempt often because it is quite complex (made even more so by the fact that I use Vege-gel so my vegetarian husband can eat it), but if you manage to make it work, it looks and tastes amazing! There are five different uses of chocolate in this Torte, and Anna presented it so well that my feeble photography skills can’t cope. Perfectly presented easter torte. I'd love to see the bird that made this nest! 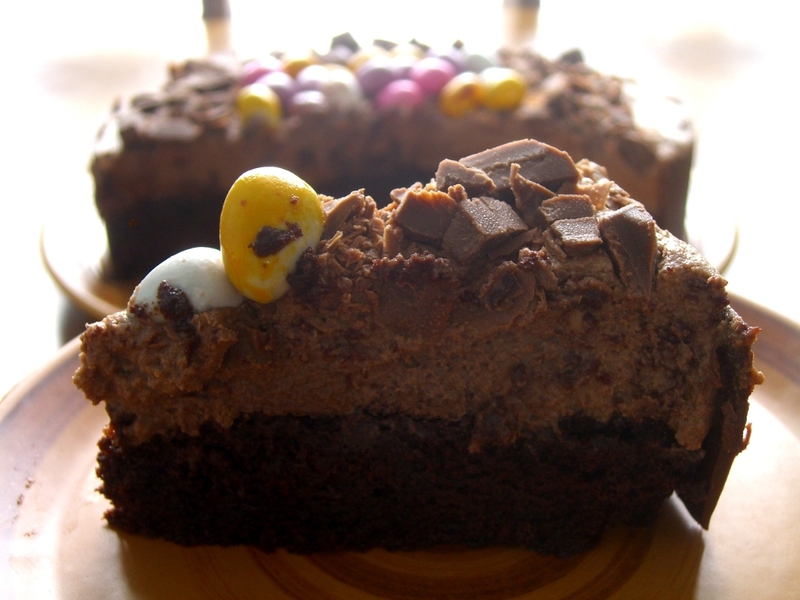 There are only four types of chocolate visible here: mini eggs, flake, the chocolate border and the chocolate mousse. The final one is a fairly thin layer of chocolate sponge, visible in the piece below. Torte, open for the eating. The imperfections only appeared on the cutting. Who made it: All Anna’s handiwork! Recipe:”Simply Cadbury’s Chocolate”, by Joanna Farrow, page 120. Chocolate Pots. That would be pots, filled with chocolate. This recipe comes from the “Co-operative magazine” which mysteriously appears every so often in the post. In fact, this magazine has some exceptionally good recipes in; so good we thought “Mmm, lets write a blog about all this yummy food”. This comes as a slight disappointment on the tail of the previous recipes from the co-op, which remain sadly unreviewed. The bottom layer is a creamy chocolate sauce, topped by white chocolate mousse, and a milk chocolate mousse. These are all pretty tasty as you’d expect, but the overall effect is extremely sweet and it took me two tries to make it all the way though. This is a shame, as the dessert would have made a perfect topping for a cake, or flavouring for smaller chocolates. In general, I’ve found this sort of dessert a bit much, favouring instead cakes or baked puddings. Perhaps I’m just a simple cake monster and should stick to what I know and love? Who made it: Anna slaved over a hot stove and a whirring blender whilst Dan supervised by licking everything he could find. Yes, everything.